Retail stockers are the backbone of every store, maintaining inventory, stopping defective and damaged products from entering the sales floor, and ensuring customers have access to the products they want and need. Exceptional shelf stockers are sales-minded and know how to position products to maximize your store’s sales, bring in more customers with organized and attractive displays, and make sure your merchandise is always in the right place, improving overall customer experience, boosting revenue, and promoting brand loyalty. Distribute, organize, and arrange inventory quickly and accurately with an eye for visual merchandising. Maintain the overall appearance of stores with displays that attract customers. Comply with store display policies, procedures, and manufacturer guidelines. Efficiently replenish shelves and maintain inventory levels using coding systems. Check products for quality, freshness, damage, and mislabeling. 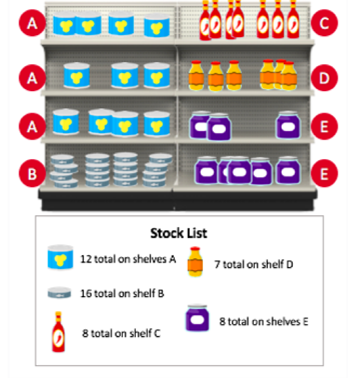 Use this powerful and quick retail shelf stocking assessment test to automate the initial screening process for entry-level or experienced candidates, especially stock clerks, warehouse workers, and retail associates, or any other positions requiring employees with a strong eye for detail, exceptional organization skills, and a high degree of independence and initiative. You are looking at a shelf of old milk that expires in 1 week. You need to add more milk to the shelf. The new milk expires in 2 weeks. How can you ensure that the old milk sells before the new milk? Compare the shelf to the stock list. For shelf D, how many more items do you need to add to the shelf? The Retail Skills: Shelf Stocking module content was developed by the Indeed Assessment Science Team, with expertise in Industrial/Organizational Psychology, Instructional Design, Education, and Graphic Design. In addition, team members worked in collaboration with subject matter experts (SMEs). Indeed’s SMEs are required to demonstrate experience performing at a high level, supervisory experience, or responsibility for defining requirements for those jobs that require retail skills.